Work has been extremely busy lately, with an endless to do list, lots of time spent planning lessons or preparing for parent conferences, before-school tutoring, and conferences after school. By the time I get home, I only want to sit on the couch. Dinner has been whatever can be prepared in ten minutes or less. If there is Mac & Cheese or Bird’s Eye Voila! frozen pasta, then that’s what gets cooked. My jogging has been happening on weekends. The breaks between jogs, however, have been great for resting up! The first workout for Week 5 went very well. I didn’t have any problems jogging three 5-minute intervals. Here is the music for the podcast I did (Couch to 5K). Music is from Pirates of the Caribbean, TobyMac, Glee, Tangled, Emma, Mansfield Park, and The Sound of Music. After giving my foot a serious rest from jogging, all was well, so I finished up Week 4’s repeat and was ready to move on to Week 5. Week 5 will be a big challenge (there’s a 20 minute non-stop jog), so I wouldn’t be surprised if I have to repeat some of it before I move on to Week 6. Week 5 has 3 different workouts, whereas each previous week had a workout that you repeated a total of three times. The Couch to 5K podcast I downloaded from here has the intervals for all three of Week 5’s workouts in the same podcast. I didn’t want to hear it tell me to jog for Day 3 when I’m on Day 1. 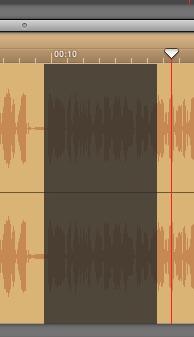 I figured out how to highlight sections in Garage Band and delete them, so I cut out the voice telling me anything except for Day 1’s jog. I did the same thing for separate podcasts for Day 2 and Day 3. Below, I’ve got some screen shots to help visualize the basics of how I made cuts. 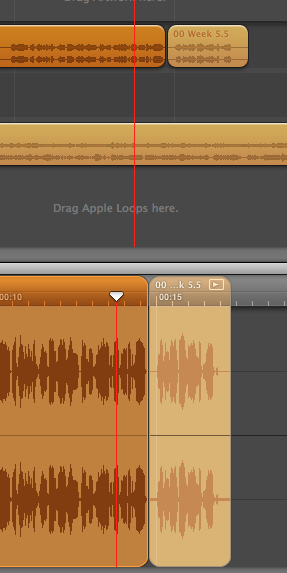 (Above) When you’re looking at Garage Band, you have the section on top where you add in your voice, songs, etc. At the bottom of the screen, it shows the detailed version of whatever you have highlighted. (Above) This is a section of the introduction, where I cut out dialogue about Days 2-3 and kept only the bits for Day 1. Then, I moved everything over so I wouldn’t have a long pause between dialogue. Sorry if this isn’t very clear, but I hope it shows that you can cut out parts of the podcast dialogue that don’t relate to Day 1, so that your podcast is only about that day’s workout intervals.